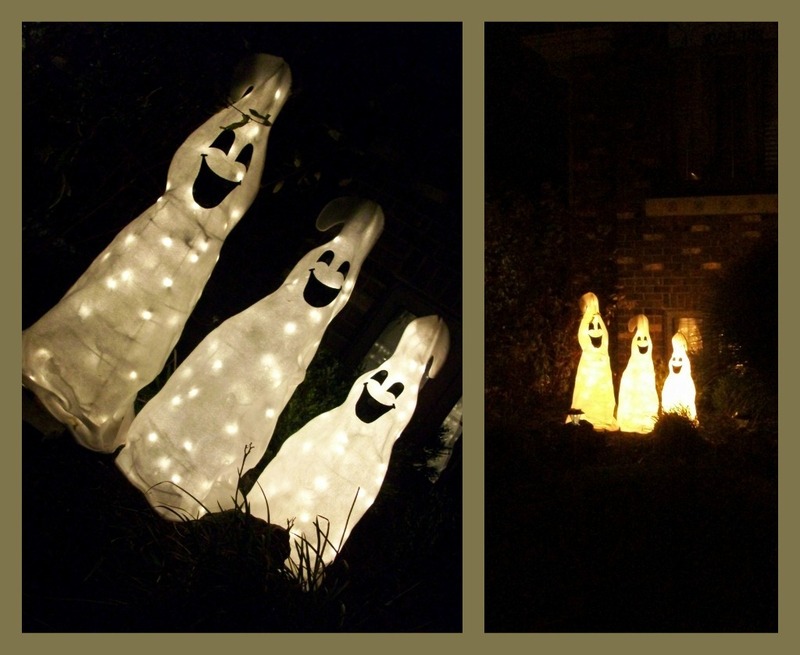 These 3 musketeers graced the garden on Halloween night and they looked amazing from the road as you drove by. They are made from white felt and the mouth and eyes are from black felt. I'm pretty sure that it was a McCall's pattern from a few years back. I made them when my kids were small, but even now that they are grown and out on their own, they still enjoy them when they come to visit. The felt ghosts are placed on metal tomato plant cages that are wrapped in white mini lights...So easy, but so effective. 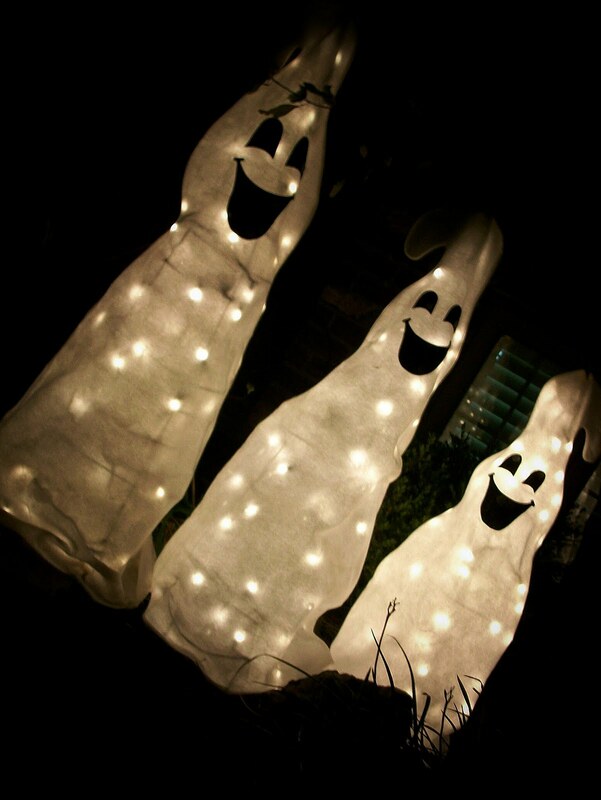 Yep, it's so sad...all these ghosts are gone....all 80 of them. 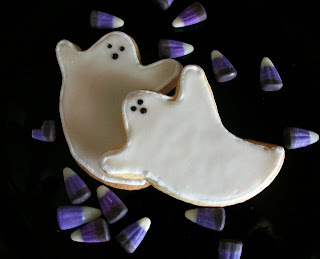 I make these with a great Land O' Lakes sugar cookie recipe and they turn out fabulous. They are my son in law's favorite and he is always asking for them. My mom and daughter came over and helped me ice them, cause that's what takes the time, but we have it down to a science because we thin the royal icing and then pour it into a plastic tipped bottle and the royal icing just flows onto the cookie perfectly. Before you flow the icing you have to pipe a firmer royal icing rope around the whole cookie and let that dry completely. All that is left to do is dot the eyes and mouth on with black icing gel. I barely get them onto a plate before they disappear. This is the centerpiece cake I made for my grandson Ayden's first birthday. It was a Halloween themed party so a haunted house cake was the perfect choice. I had such fun making it and it looked adorable. You make the spooky trees by melting chocolate in a zip lock bag and then squeeze out your tree pattern onto parchment paper. The cupcakes are trimmed in chocolate sprinkles, the windows are made from rolled out tootsie rolls and the windows shutters, door and gravestone are from Oreo cookies cut in half. 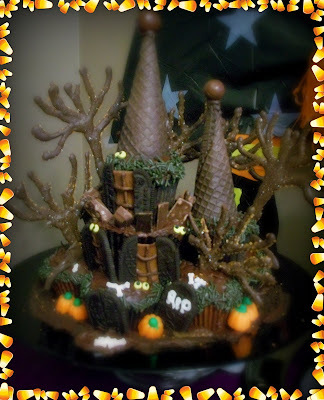 The turrets are chocolate wafer ice cream cones with malt chocolate balls stuck on top and I was able to pick up candy bone sprinkles at Michael's. The creature eyes are made from royal icing. 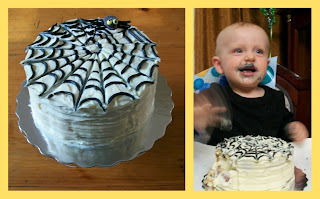 My grandson Ayden turned 1 on Friday and on Saturday the family celebrated with a Halloween Birthday bash. It was great fun, everyone dressed up in costumes and Ayden was a skunk. 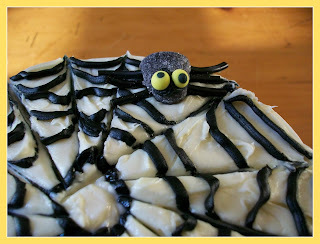 My daughter wanted him to have his own cake to celebrate with so keeping with the Halloween theme I made him this spider web cake, complete with spider. The first thing he went for was the spider of course. Once he figured out the icing was sweet, that was pretty much the end of the cake. You can see what ensued once he got a taste of that sweetness. 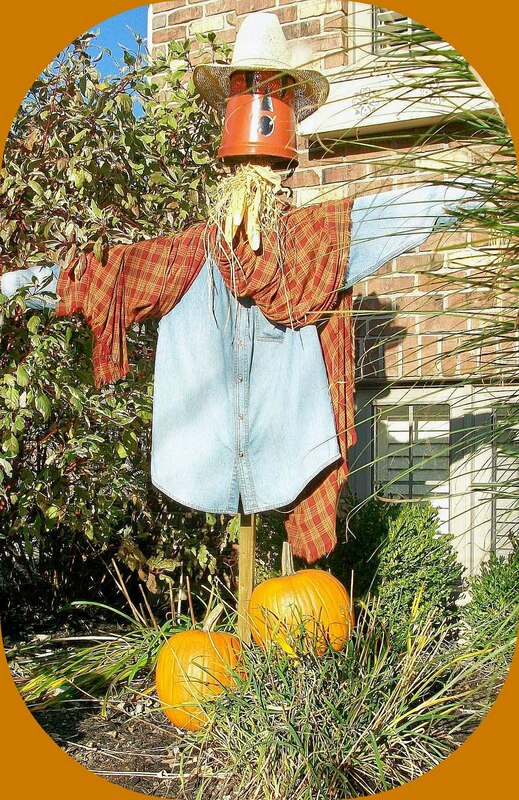 This is the scarecrow that graces our front yard during the fall season. I just love the way he looks with his cowboy hat and his denim shirt. His head is an upside down painted maple sap bucket and it works well. 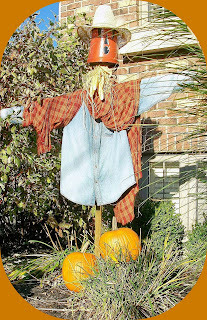 I have little corn husks tied around his neck and a great big orange plaid scraf draped over his shoulders. I'm gonna hate when the snow flies and I have to put him in storage for another year. 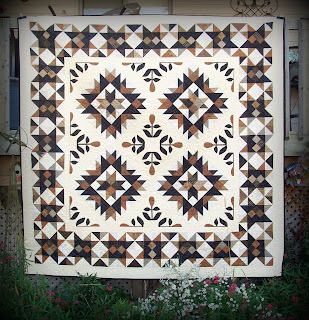 A few posts back I showed the runner I made from the leftover panel pieces from this quilt. I made this quilt for my grandson so he could enjoy it at Nana's house when he comes to visit. 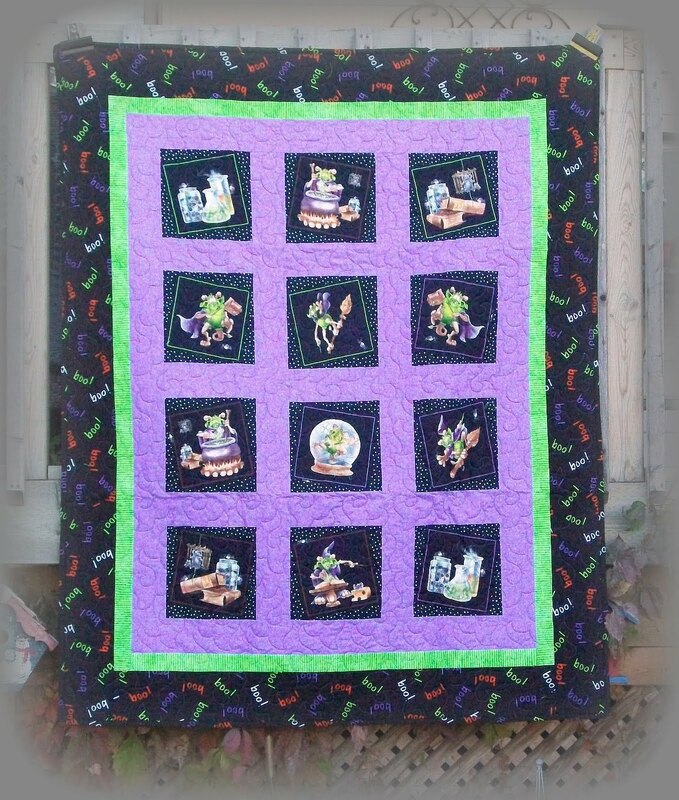 There are all this lovely little ghoulish creatures doing spooky, scary things all over the quilt. I thought that he would have fun looking at all the little bugs and creepy monsters on it. It was set in a wonky block pattern and has a boo print for the outside border. 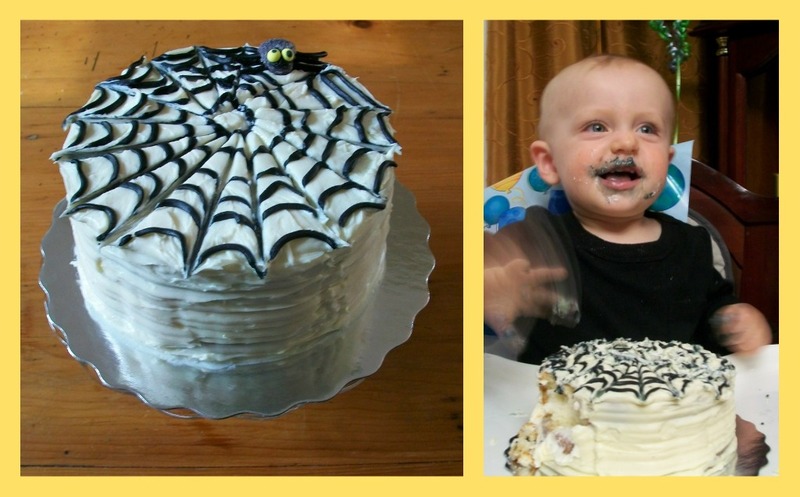 He's only turning 1 this year so it might be a while before he really enjoys the Halloween ghoulish guys on it. 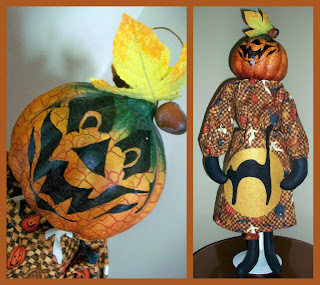 I just love getting all this little guys out over the Halloween season for everyone to enjoy. I made this little table runner from leftover quilt panel pieces. 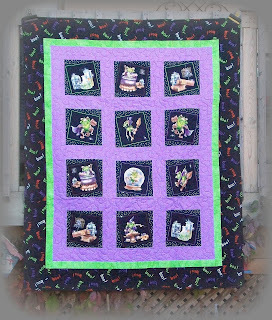 I originally picked the panel up at Patchwork Porch during a shop hop a few years back. I finished a quilt of them and had a few left over to use for this runner. I love the creepy things in the beaker jars, the ghoulish little creatures hiding out and flying around. I set the panels in wonky blocks and it turned out quite effective. It's a fun piece to display over the Halloween season. called We Three. The pattern called for a Styrofoam ball with Paper clay over it but that seemed like too much work so I bought this little pumpkin head at Michael's and drew the face on with permanent marker. 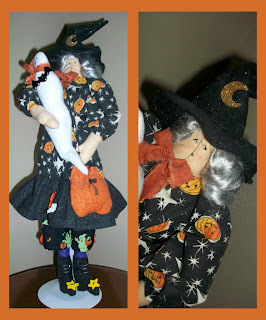 She is so cute and so much fun to put out at Halloween. This sweetie is a Bunny Hugs pattern called Trick or treat...how sweet. 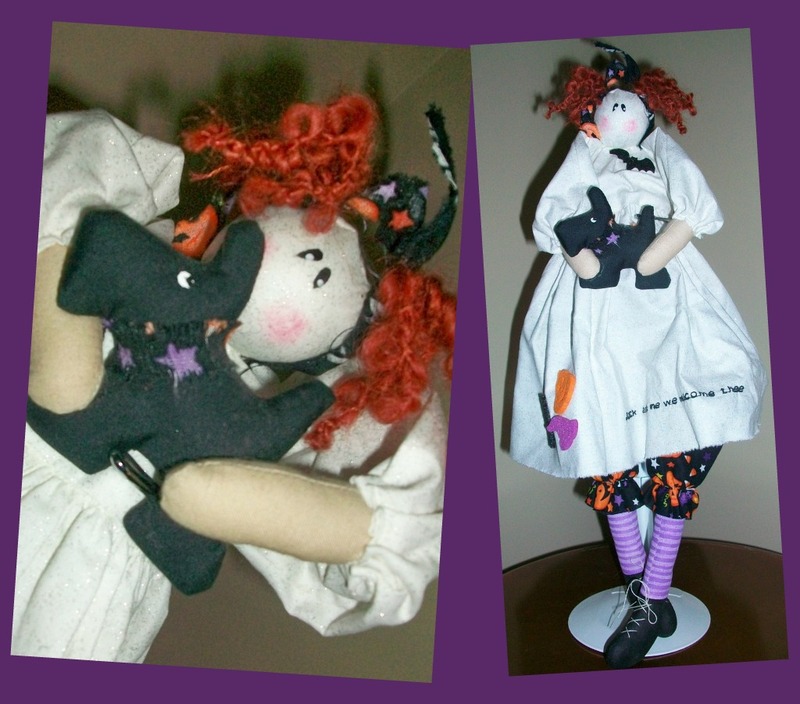 I made her a few years back and love that with the Halloween season just around the corner, I can bring her out to enjoy, She has her very own treat bag and ghost. This was the purr...fect little vintage find at a local store. The scroll design down the cat and around the base is wonderful. 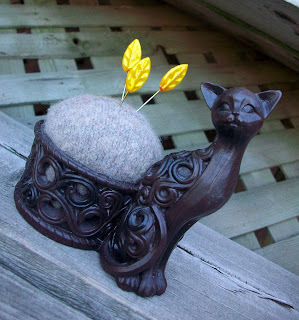 I added a felted wool ball for the pincushion and dressed it up with these lovely leaf pins from Joann's. 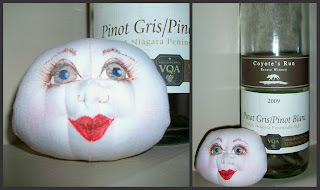 I'm getting quite a collection of these pincushions now. My husband says that if I get anymore, he'll leave me.......sure gonna miss that man! This little bag was offered a while back from Moda. Isn't it adorable. It's made from 10 Honey Bun strips and sews up in a jiffy. My sister-law received this one for her recent birthday. 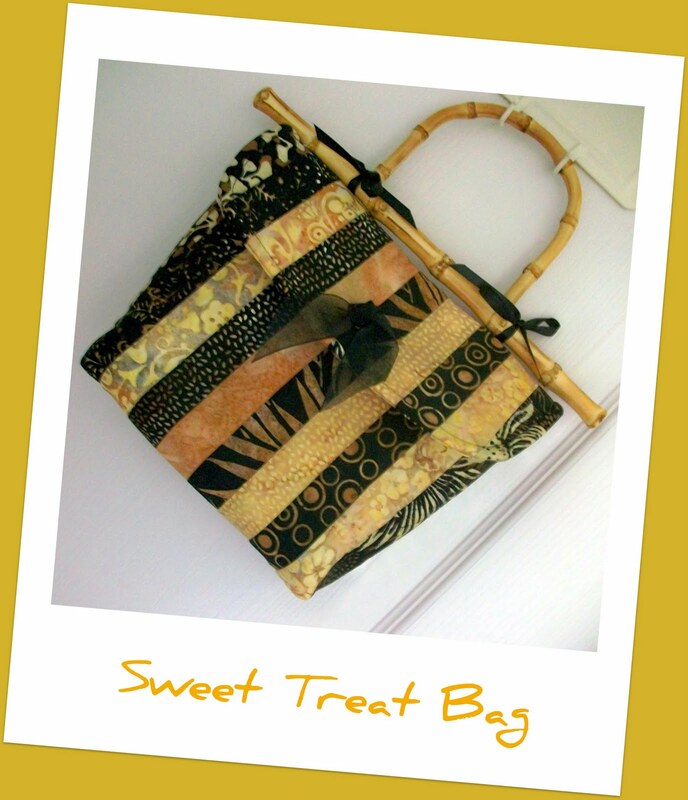 You could use it to store your quilting tools, you can use it as a travel bag or even a gift bag. I added a little handle to it, tied on with ribbon so you can use it as a small purse. Gotta make some more of these with the holiday season just around the corner. It's a great gift when you just need a little something for that special someone. This quilt was sent to me to longarm from Yellowknife from my customer Elizabeth. It is a beautiful quilt and has special meaning for her. The quilt is called a hokey pokey quilt -- her friend sent her the pattern. She decided to do it all in pinks for a friend and colleague of hers who is fighting breast cancer. She is in her late 30's with 3 young children. Elizabeth sent out cut out hearts so that people can write a message to her and she plans on hand appliqueing them onto the back of the quilt. She has raised thousands of dollars for breast cancer research and is presently participating in a study out of California since there is nothing else that can be offered her here in Canada. I quilted it in Angel Wings as it just seemed appropriate that someone needs to be watching over her during her difficult fight. 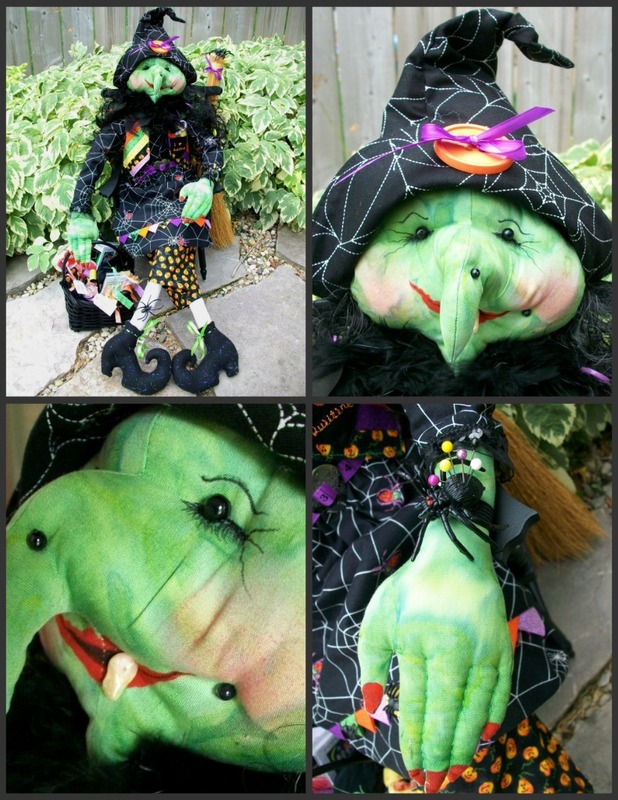 Meet "Stitch the Witch", this is a doll I designed for the Halloween season. She has been offered as a doll class at Kindred Spirits Quilt Co. and the ladies in the class are doing a wonderful job of recreating her. She is perfect for quilters with her prairie point dress, strip vest, I love quilting pocket, spider pincushion, button hair, spool shoelaces and tape measure belt. Her body and face are of batik and are slightly sculpted. 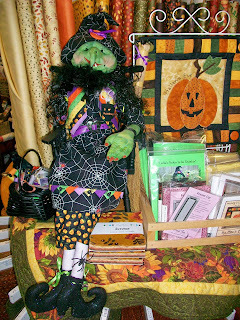 Here she is visiting the local quilt shop...Patterns packages "witch" include the hair and boa for her neck are available for purchase for $15.00. Postage will vary, depending where you live. If you are interested just add a comment with your e-mail and I will contact you. Linda, one of my favorite quilters and customer, brought me this beautiful batik quilt to long arm. The colors are so vibrant and it looks phenomenal quilted with "Happy Times". 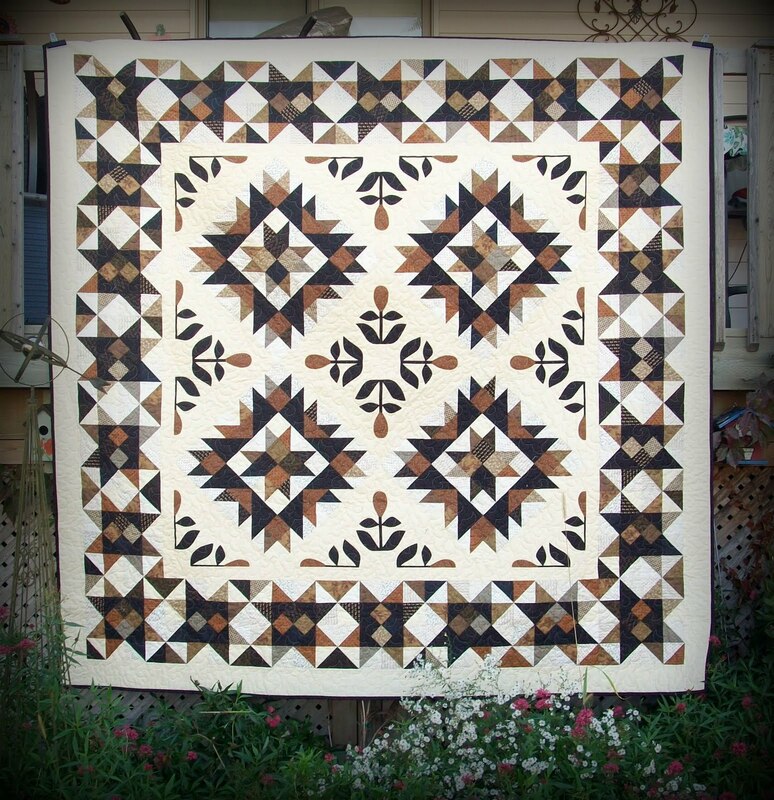 The quilt is a pattern called Pinwheel Pirouette from the book Strip Clubbung. This quilt is for Linda's niece for Christmas.....lucky girl . I had promised myself this year that I would finish off some of the UFO's I had stashed away. I am slowly working through my promise even though it is so difficult. I want to start new projects, but I have kept my word and am working at getting them off my list. ( I have started new projects, but they are the samples for Kindred Spirits Quilt Co.). I thought I would get going on this one, it had been in the cupboard for ages. I had it all complete except the outside 2 borders and with the autumn season in full swing I thought it would be good to finally get r' done. I had started this years ago at Gone to Pieces and it had been part of a Thimbleberries Club. 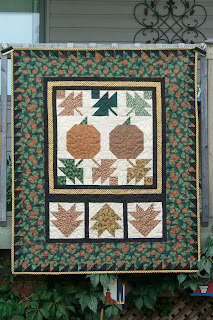 You made 4 seasonal quilts and I had only finished one of the 4...how sad is that. The greater sadness was when I was trying to jog my memory as to how long I had tucked this baby away...to my shock...the sheet of instructions was clearly marked 2003....now that is sad...7 years to complete a wall hanging. Thank goodness Thimbleberries never go out of style. The mystery is solved. Last month was the final installment and final clues for the Border Creek Station Mystery Quilt monthly class held at Kindred Spirit Quilt Co. Some of the ladies in the class had figured it out on their own without the final clue. I received a few calls at home trying to coerce me into divulging a clue before the class to confirm their findings. Shame on you ladies. All the quilts will be gorgeous when they are complete and I'll make sure to take pictures and post them as each one is very different. I've been designing and teaching doll classes for the local quilt store, Kindred Spirits Quilt Co. First there was Garden Angel Annie, then Stitch the Witch and now I'm working on a Christmas angel. This class is a little more complex than the last two with the face being sculpted and painted. I have yet to work on her body, dress and wings. Hopefully I'll get to that tomorrow. Her head will be attached to a body that sits on this wine bottle so the angel will stand nicely. I think she turned out quite pretty and can't wait to get her finished. This puppy was a vintage find at a local thrift store. and the trusted glue gun. 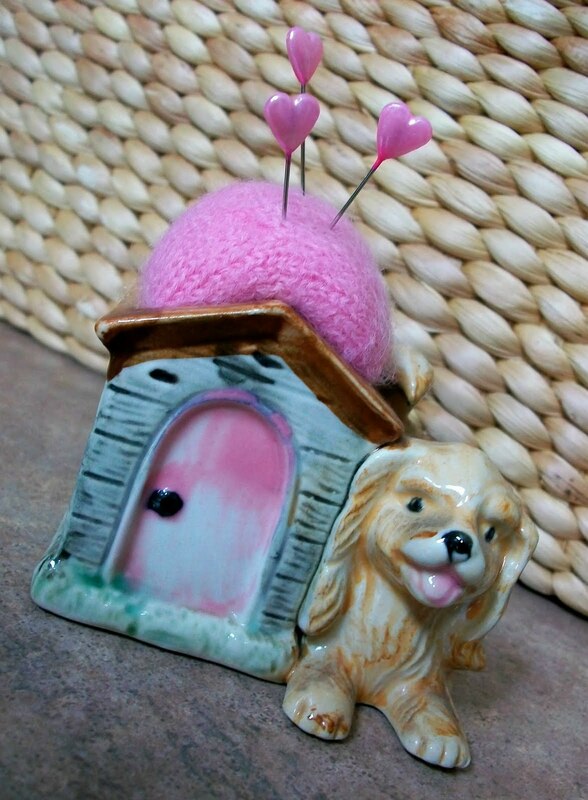 I love the little pink heart pins that match the pink in the pincushion and front door. This would be the perfect little town to live in...3 shops side by side and what could be better than a deli, a quilt shop and a knitting boutique. You could have lunch at the deli, build up your strength to carry all the fabric stash that you purchase from the quilt store. Then it would be off to see the lastest wools and patterns at the knitting boutique. Now that would be an afternoon well spent. This is Block 5 of Tiny Town BOM by Bunny Hill Designs. It's being featured as a class at Kindred Spirits Quilt Co. and we have quite a few quilters signed up. I guess everyone loves it as much as me. I am really partial to this little guy. With Halloween just around the corner it's fun to get these treasures out to enjoy. When I first saw the pattern for this fellow I just had to have it. My hubby's name is Frank and that might be short for Frankenstein and I can sort of see the resemblance ...along the hairline. 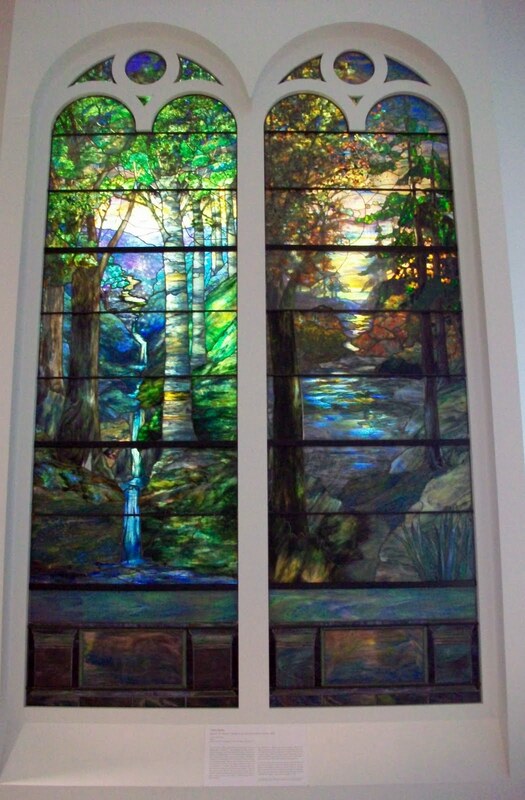 These are the most beautiful stain glass windows I have ever seen. Absolutely breathtaking and then were on display at the Brooklyn museum. 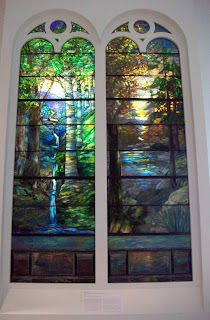 The windows are called Dawn in the Woods in Springtime and Sunset in the Autumn Woods and they were the works of art by Tiffany Glass Company in 1905. When we visited Little Italy in NYC we found that they were celebrating the Feast of San Gennaro. Mulberry Street was blocked off with the festival and vendors had shops, booths and restaurants set up. You could taste just about anything Italian. 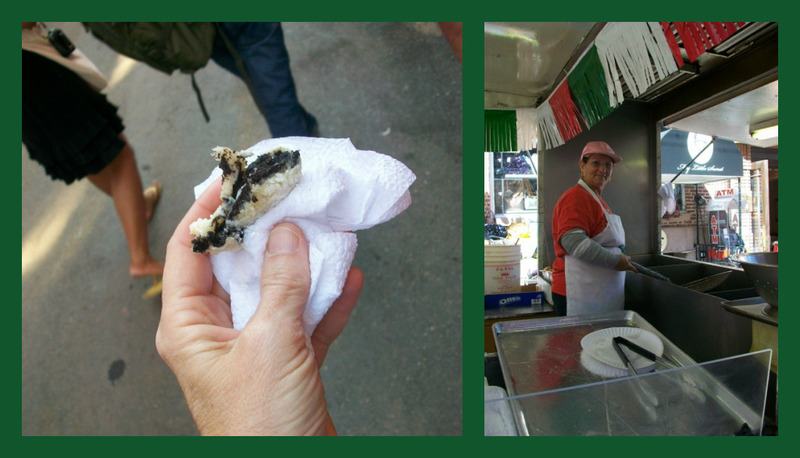 How much more Italian could you get than fried oreos? ?.....they coat the oreo cookie in batter and deep fry it, then dust it in powdered sugar...major low cal. But it was to die for...it was so good. Here the picture of the lovely little Italian lady making mine up fresh. They were only $1.00 each, so a bargain as well. I did the math when we got home...you can buy a package of oreos for $2.99 and you get about 30 in a package, that averages about 10 cents a cookie...it was $1.00 each or 6 for $5.00, but my hubby put his swelled foot down and wouldn't let me get the half dozen! I have a deep fryer, I think I'll try them at home. wonderful subway system that can take you virtually anywhere. Even with such a phenomenal system, as a tourist, you still walk and walk and walk. After about the 4th day of dragging hubby all over NYC, his leg and ankle started to swell up and he could barely walk. He rarely ever complains about anything so I new he was hurting when he did mention it. He was in agony. The last 2 days of the trip were spent with his leg up in bed trying to ice it to get the swelling down. ( once home and up to the doctor, turns out it is gout). I had a list of things yet to do in NYC and while I love him dearly, it's not much fun in the hotel with him watching the swelling go down. I had wanted to go to the museum of Natural History uptown, however we were staying in Brooklyn and he didn't relish the thought of me going all that way on the subway by myself. I found out that Brooklyn has a museum of it's own, and he was comfortable with me venturing there. 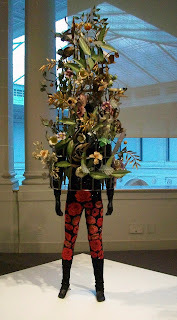 I spent a nice afternoon exploring and came across this sculpture in the contemporary art section of the museum. 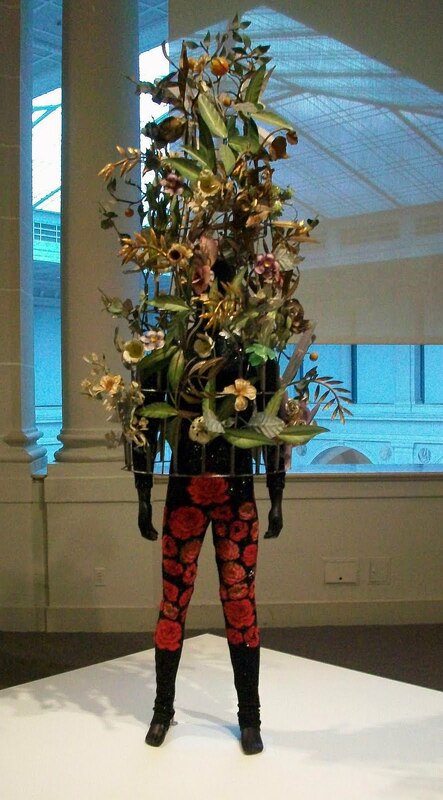 It's Nick Cave's Soundsuit exhibit, but I laughed when I saw it cause it just reminded me of a really bad hair day. 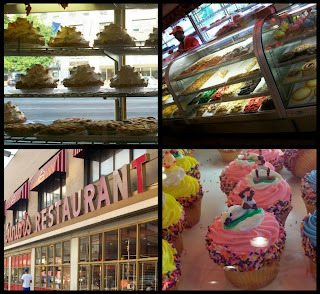 NYC Trip...What do these all have in common? What do all these things have in common? Well if mommy agrees to go to the Yankee game, and mommy agrees to go to the New York Islander game, then daddy agrees to let mommy visit The City Quilter and mommy gets to buy stash. It's all about compromise and we're getting really good at it after 30 years of marriage. This is what I picked up at The City Quilter while we were visiting NYC last week. I've been looking for just the right yellow 30's print for a Sunbonnet Sue quilt I'm planning on doing. 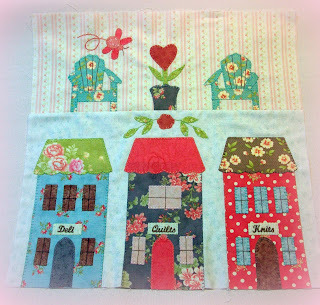 It's a quilt with a combination of machine embroidered BOM Sunbonnet Sue set with sashing. This yellow was perfect. The little pink apple buttons are for the trees in my Tiny Town BOM I'm working on. I've only ever seen the apples in red, so the pink ones will be perfect for that project. 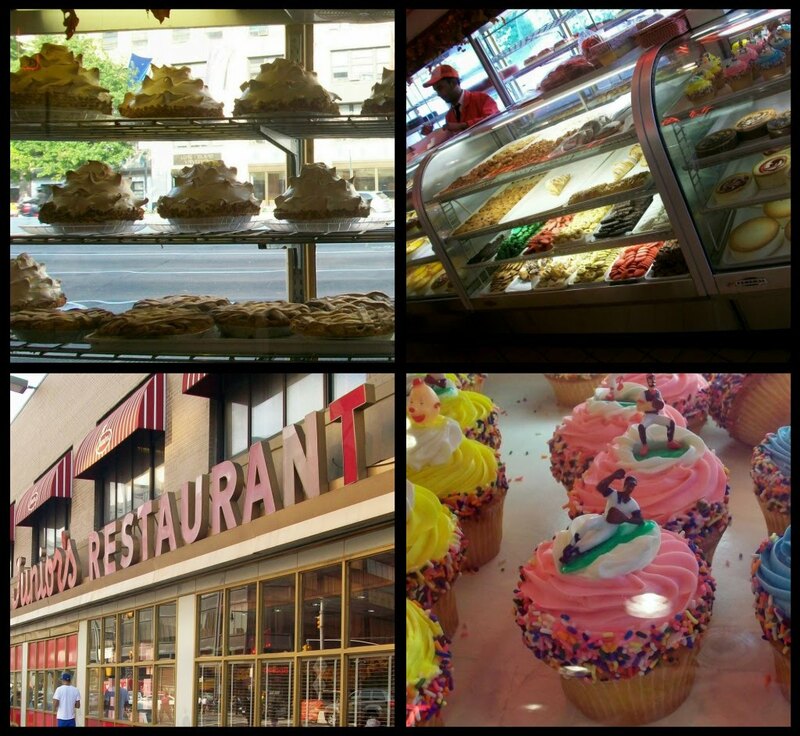 We were just blocks away from this fabulous bake shop and restaurant in Brooklyn when we visited NYC last week. It's called Juniors and it has some of the best food in Brooklyn. Breakfasts were to die for along with their baked goods. Get a look at those mile high pies in the window.....Lemon meringue....When we got off the subway at night we'd pop in and pick up a blueberry and cherry turnover for the morning with our coffee. Each turnover could have fed a family of four, but what the heck we were on holidays! OMG, There's me at Chelsea Studios in NYC, with Martha.....I love Martha, I'm her biggest fan. Don't get excited, cause that's as close as I got to her. I entered the web thingy and tried to get tickets for the week we were going to be there. You were suppose to get a response about 3 weeks before the show date you had picked...and of course we got no e-mail telling us we were selected. The website also said that you had a good chance of getting standby tickets if you arrived the days of taping by 8am. Before we left on the trip, I checked the website and it indicated that she taped on Thursdays. On the Thursday morning I got my hubby up at 6:30am, we were showered, dressed and on the subway from Brooklyn by 7:15. We walked over to the studio and were there by 7:45, and I thought OMG this is great, were bound to get standby....my hubby says "look no line up yet so that's good". Not knowing exactly where to stand in line, cause there wasn't one, we asked a fellow that was near the studio entrance. 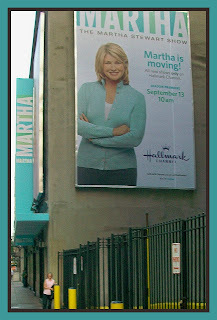 He looked at me as if I had 2 heads..."she doesn't tape today, she taped Monday, Tuesday and Wednesday this week"...........!_#$^&@*_~@&^~^# So this was as close as I got to Martha.